Yes, another new book, but maybe not for most of you folk, as it's narrow gauge! Published by my favourite railway publisher - Black Dwarf Lightmoor, this is a sequel of sorts to the Author's father's volume from the 1960s - Narrow Gauge Album. The difference is that the photographs are crystal clear, not the grainy, flat printing of Ian Allan in those days! About a quarter is Irish content, as you can tell from the Contents. The late Patrick Whitehouse presented, with Pat Garland, the BBC's programme Railway Roundabout and while he was making it, he took many very fine colour images of three of Ireland's best loved narrow gauge lines. I don't approve of printing across two pages, but one shot of a steam train in the Barnesmore Gap almost brought tears to my eyes. 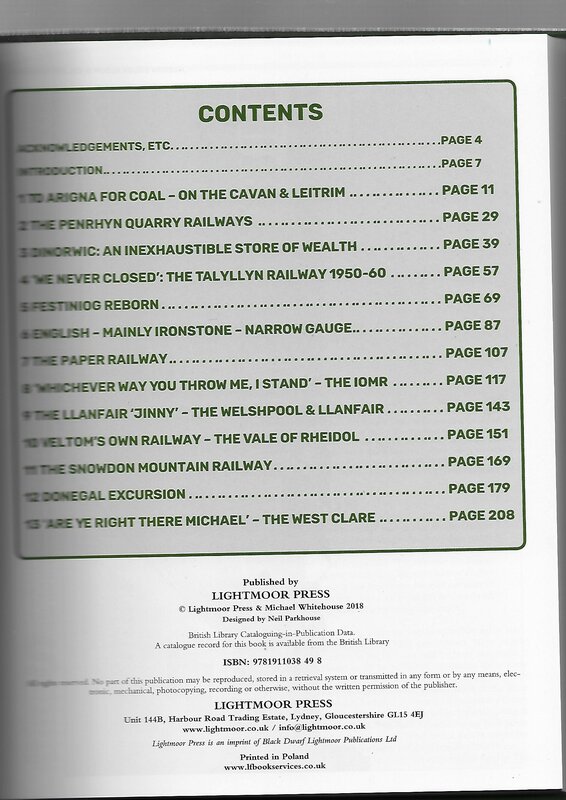 A must for the narrow gauge folk, especially if you like the Ffestiniog and IOMR as well. The Syndicate (profits to Irish preservation) will send it to you IN THE UK ONLY in time for Christmas for the cover price of £25 post free. Stock on hand now. I very much regret that because of the extreme weight of the book, sending to Euroland is not practical, as the postage is about £10 for a single book. If a bunch of you wanted it, I guess I could send a pile to one place for distribution? If you're interested in the book, please PM me. Thanks to those of you who bought your "Irish Railway Memories" from us - they were posted to you on Monday - the publisher was very slow in replenishing our stock! We've still got that in stock. More books? Yes please. If JHB and BC ever do a book "Black'n'Tan era pickup goods traffic, H-Vans and Beat wagons into the sidings" I'll buy a dozen copies Rails through the west is already pretty close MGWR Rails through the hidden midlands covering places like Birr, Banagher, Tullamore, etc, could also be very interesting. Many thanks for that recommendation, Noel, much appreciated. Barry and I have several vague ideas about a third volume in the series, and as it happens I’m off to call with him this evening! A goods volume may indeed be interesting, and one project we had (albeit only vaguely) considered would include quite a bit of fertiliser and beet. As always, as a schoolteacher of mine used to say at exam time, “time is of the essence”! I spoke with the author many times during it and gave him the caption for the image of 6T on the C&L at Tomkin Road. T&D book out next year that I'm quite involved in. Our own steam loco "Nancy" features among the Ironstone railways. She will be the first 3ft gauge iron stone steam loco to run in preservation and was very much akin to a Barry rebuild for us. We have spent £160,000 to date and she will return in February to Dromod. 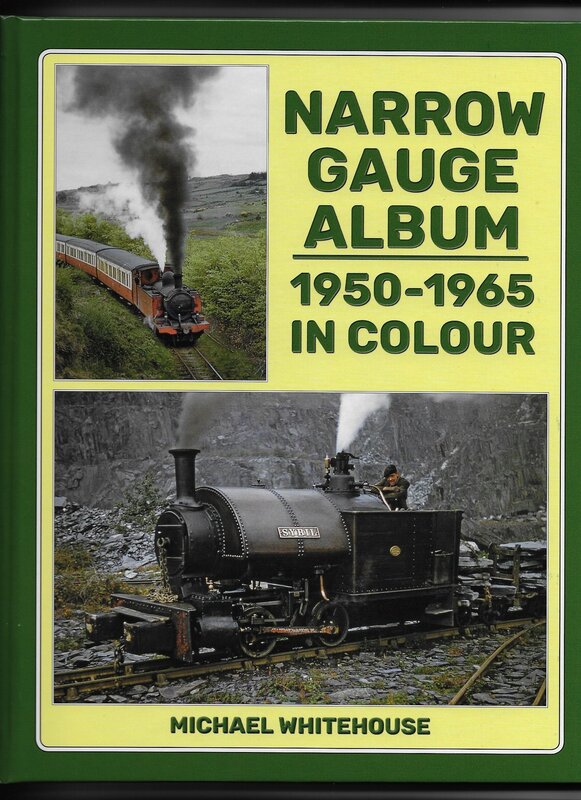 Definitely seems appears to be a sequel to "Narrow Gauge Album", the original is definitely worth while seeking out in second hand bookstores or Amazon for its account of the early days of the preservation movement and stories of railway operation. Following on on Noel's suggestion a series of pictorials of lines in the Midlands would be nice, perhaps combining colour and black and white photos with condensed versions of J P O'Dea's John O'Meara's, and N J McAdams IRRS papers would really bring the operation of these lines in the 1950s & 60s to life. 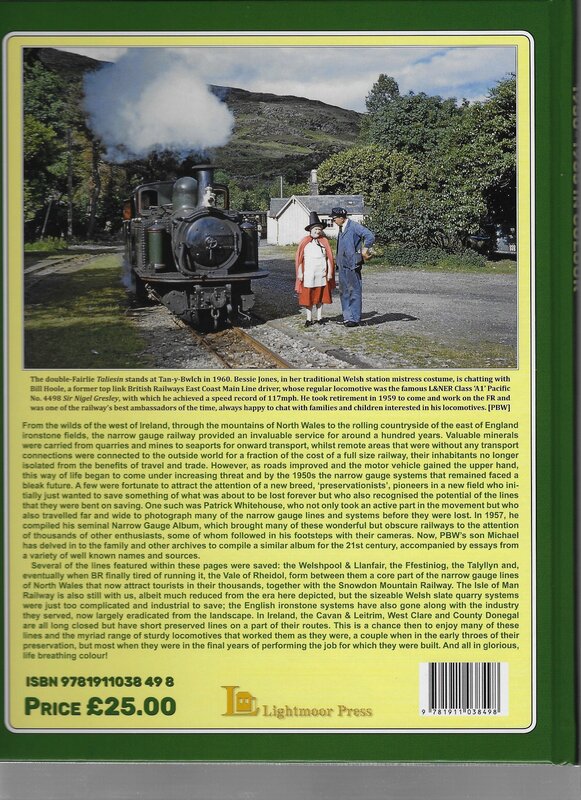 The more recent Ian Allen/Midland Publishing Irish Railway Pictorial series contain high quality photos through from the steam age to the present including albums on the Great Southern Railways, Great Northern Railways, a number of regional and narrow gauge albums.